The Alzheimer's Talks is a series of compelling conversations with public figures on their perspectives and personal stories about aging, memory loss, caregiving and the positive power of creative expression, presented by the Art of Alzheimer's in partnership with the UW Medicine's Memory and Brain Wellness Center (MBWC). 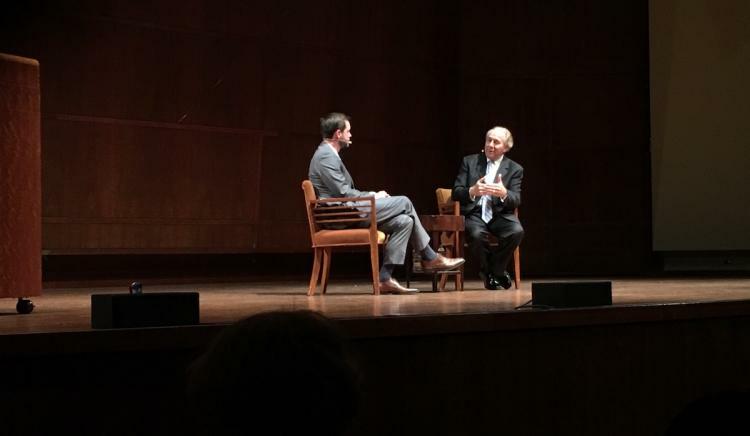 The series debuted on May 23 at Benaroya Hall, with an interview with Michael Reagan, the eldest son of President Reagan and a talk radio host with the gift of gab. The conversation, led by Kristoffer Rhoads, PhD, neuropsychologist at the MBWC and the Alzheimer's Disease Research Center, ranged widely in topic, but always returned to humanizing portraits of President Reagan and the changing nature of the father-son relationship as his dementia progressed. On November 5, 1994, President Reagan penned a now-famous letter to announce his diagnosis to the nation and encourage readers to promote greater awareness and understanding of dementia. He had seen how efforts in cancer awareness led to many more cases of early diagnosis and successful treatment, and hoped that could happen again. Michael Reagan has since taken his father’s vision forward and is now the chair of the John Douglas French Alzheimer's Foundation. The Art of Alzheimer's: The Artist Within. Surprising, delightful and inspiring art by vibrant people, 60-101, living with dementia. Reagan spoke from experience about the ways in which stigma and fear surrounding dementia can cause real harm. Families are often afraid to talk openly about their struggles with dementia, even as millions of families face the same challenges. Stigma discourages people from seeking early diagnosis and opportunities to intervene with lifestyle changes or therapeutics. Finally, stigma makes people less likely to participate in research or clinical trials, stymieing the efforts of researchers trying to find effective treatments. The personal stories Reagan shared, however, gave emotional weight to these ideas. One particularly memorable anecdote hit on the main theme of the Art of Alzheimer's organization itself, with its power to remind people of the vitality of people with dementia, despite cognitive impairments. One day, Reagan visited the family home, and for the very first time, he forgot to give his father the good-bye hug. He turned around in the driveway to see the former President on the doorstep, arms outstretched. It was a revelation—Ronald had “remembered that Michael had forgotten” the hug. In the audience question period, people asked about ways to raise research funding and awareness. Reagan suggested that people petition members of Congress as they work on a budget to fund the National Institutes of Health. 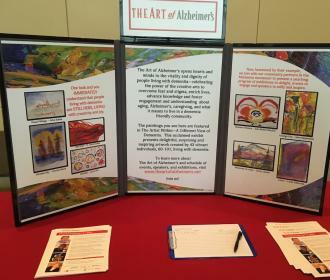 He also advocated for the Art of Alzheimer's exhibit of paintings by people living with memory loss, and similar efforts, to travel to every city in the country to cultivate a healthier perspective on dementia in the younger generation. “We have to make noise!” he said. The next Alzheimer's Talks is My Mind Unwrapped: My Relationship with Alzheimer’s. Madison Cowen, the first-ever Grand Champion of Chopped, will share personal and often humorous insight into the cognitive decline and its effects on loved ones. June 14, 2017- 7:30 pm. Sign up to attend.